Charlie Zender, Associate Professor and Director of the Earth System Modeling Facility at the University of California, Irvine, and Florent Dominé, former CNRS Research Director at the LGGE (Laboratoire de Glaciologie et Géophysique de l'Environnement) in Grenoble, France and currently Senior Scientist at CNRS at the Takuvik joint International Laboratory at the Université Laval, Québec, have been looking into black carbon's effect on snow albedo using a new laser-powered optical device that Dr. Dominé invented, and seeing if their observations line up with predictions of Dr. Zender's models. Dr. Zender normally teaches and conducts research on aerosol-climate interactions at his home institution. 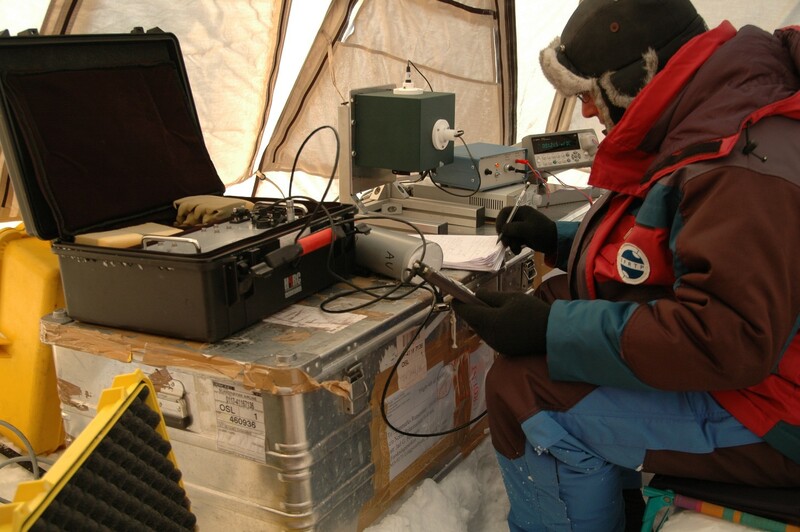 He is currently taking a year's sabbatical in Grenoble working with Dr. Dominé, who has spent a lot of time conducting research in the Polar Regions and has used his optical device to measure snow albedo during time he spent on board the TARA in the Arctic a few years ago. 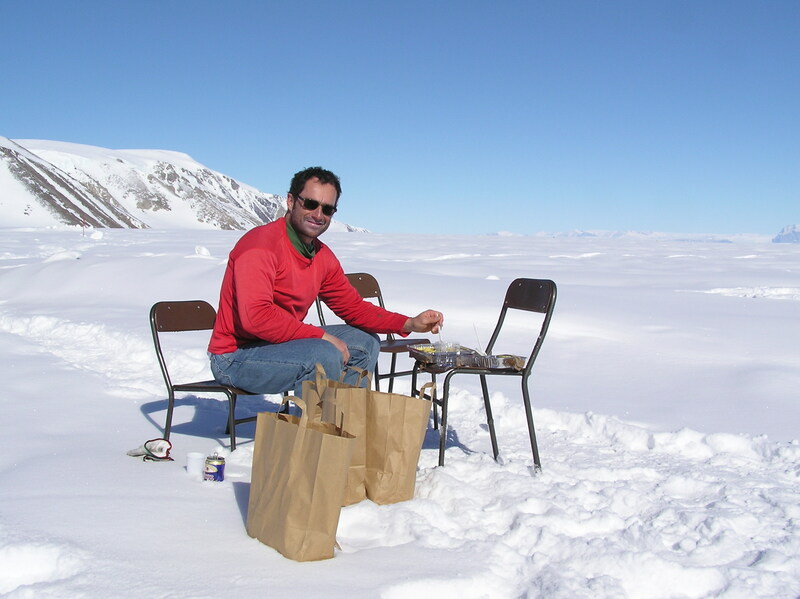 Dr. Dominés research interests include air-snow interactions, snow physics and snow chemistry. Both took time out of their busy schedules to speak with Science Poles about the fascinating research they're currently involved with. What exactly is involved in the experiments you've been doing at the LGGE to look at the effect black carbon has on snow reflectance? These experiments begin with collecting fresh, clean surface snow in the mountains near Grenoble, usually during or just after a snowfall. This natural snow serves as the blank or background carrier snow for the black carbon impurities. We ordered the pre-made "soot" (the term has many meanings) from a chemical manufacturer. We combine the snow with the soot in a cold-room (normally -15 °C to retard snow metamorphism) in the lab. We place the snow into two identical containers and then stir the snow with an industrial blender. We mechanically blend a pre-measured amount of black carbon into the experimental snow, while keeping the "blank" (control) snow clean. Then we measure the reflectance of a small sample of the snow in the integrating sphere which has a diode laser measuring device attached. We repeat the measurement about a dozen times to beat down the "noise" in the reflectance signal. The "signal", i.e., reflectance change due to impurities, is the reflectance difference between the clean and doped samples. 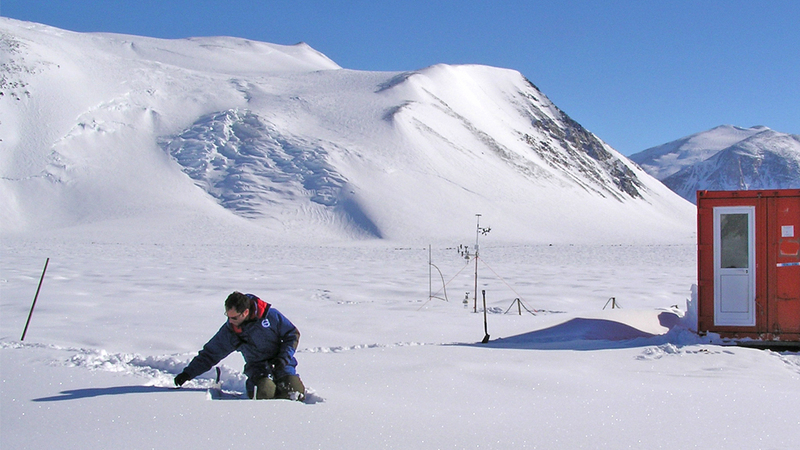 The albedo measurement reproducibility is about 1% for natural snow. This means that when we measure on different days, say, two samples of natural snow from the same snow pit, their albedo may differ by 1% simply due to small changes in density, calibration, etc. A 1% change in albedo is also the change you'd expect from the addition of a few hundred parts per billion of soot. The measurements we took agree with our models, which predicted that albedo decreases between 5 and 70% for black carbon concentrations from 0.2 to 200 parts per million. However this experimental confirmation of the modelled albedo reduction does have its limits. First, black carbon contamination of snow and ice in polar regions is typically between 1 and 200 parts per billion, which does not overlap with what our instrument can detect. Second, black carbon may be aged, hygroscopically coated (meaning the particles absorb water from the surrounding environment), or even internally mixed with snow grains. These conditions still show up as albedo perturbations, but make attributing the exact cause of darkening more difficult than it seems at first. So you have to keep in mind that our results are really just an early step forward in evaluating and improving model representation of how black carbon affects the complex cryosphere. How did you two come to work together on this project? Florent and I met two years ago in a serendipitous turn of events that had to do with studies that we'd both been doing independently. Florent had been working on measuring snow reflectance and snow aging at the LGGE, while we at the University of California, Irvine were working on modelling black carbon's effect on snow reflectance and snow aging. What sparked the collaboration was that our models suggested that we would see a very large impact on reflectance and snow aging if the snow were contaminated by black carbon. Florent had been working with pure snow, not snow contaminated with black carbon, so we came up with the idea of using Florent's new snow albedo measurement system on snow with black carbon to see if the changes in reflectance would match what we're seeing in our models. I made plans to come to the LGGE in Grenoble, so now we're here working together. We're supported by the NSF (National Science Foundation) and NASA on my side, and by Florent's lab, the LGGE, which is a CNRS lab on his side. I would say three years or longer. It may change to something else along the way. 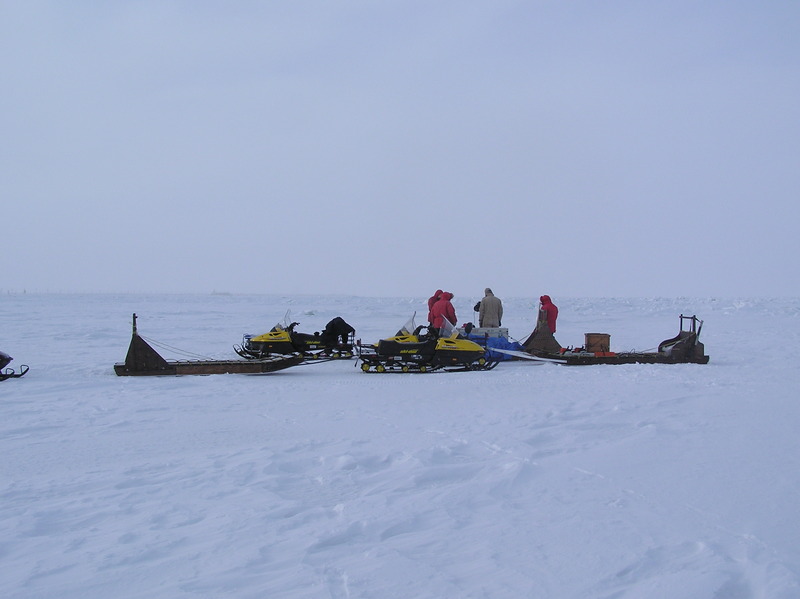 The first data from our black carbon doped snow reflectance experiments that we presented at the European Geophysical Union General Assembly in April hasn't been submitted yet. We're writing that up right now and we're also thinking about follow-up experiments. It would be good to get the measurement apparatus that we've been using in the lab out into the field. We've been thinking about bringing it to places that are exposed to the environment. Not necessarily Greenland or Antarctica, because the amount of soot that can be seen there, except after strong pollution events like boreal fires, or from camp-generated pollution, is probably hard to detect with our apparatus. Would you be able to detect soot maybe from glaciers in the Alps? I think that's a possibility. There's a group at the LGGE that has been looking at atmospheric concentrations of pollution here in the Alps. The thing is, you can not only look at soot concentrations with this apparatus, but also dust. There are certain places and certain times of the year when you would expect to see more dust. In the Alps there are lots of contaminants in the snow. You even get dust form the Sahara sometimes. But there are also local sources of contamination and there have been some studies done looking at organic pollution in snow and glaciers in the Chamonix Valley and the Maurienne Valley, where there are two major freeways with lots of truck traffic between France and Italy. Pollution form this truck traffic has been a concern to us, so we've done studies to measure in the atmosphere and to some extent in some places in the snow levels of soot, or black carbon, and other forms of pollution that come form truck traffic. In many instances this pollution is easily detectible; this concerns us at our lab and people worrying about the Alpine environment in general. So you'll be taking your apparatus out into the field in the near future? We've already taken it into the field to test it in Col du Lautaret here in the Alps about two hours' drive away, and it works fine. I also used it a year ago at the North Pole on the TARA expedition, which drifted through the ice in the Arctic from Siberia to the Fram Strait over several months (although I was only aboard for a week). I used it on the TARA to measure the optical properties of the snow covering the ice pack. So it can be used pretty simply and efficiently in polar environments. It's fairly inexpensive, it's simple to use, and it's relatively light. Although the current version can be carried, we're also working on a lighter version. But Dr. Zender said it might not be able to pick up certain concentrations of particles. That's true. The initial purpose of that apparatus was to study how optical properties changed depending on the physical transformations of pure snow. The optical properties of pure snow depend on its metamorphic state, which is determined by its age, how it's formed, etc. But when Charlie came we decided to use it to study changes in the chemical composition of the snow, namely the deposition of contaminants in the snow. On TARA I focused only on the physical properties of snow, not its chemical contamination. But in the Alps we can definitely study chemical contamination of snow. However if the Arctic gets dirtier through increased ship traffic or something like that, then we might also be able to study chemical contamination in the Arctic with this instrument. But if black carbon has been responsible for such a significant part of Arctic warming, surely you can measure its presence there. There are measurable amounts of black carbon in the Arctic. It's just not measurable with our optical system. It can be measured using chemical methods, which have very low detection thresholds. But these methods can't be used in the field. What you have to do is sample the snow, sometimes pre-filter it, freeze it, and bring it lab to analyse it. So it's not possible to do any real-time analysis. At the moment there aren't any instruments sensitive enough to be used in the field. Do you think it might eventually be possible one day to modify your optical apparatus so you can use it in the Arctic? We'll see. Again, the initial purpose of this instrument was to study physical transformations in the snow, and it works very well. So for that purpose we don't really have any need to increase its detection limit or its sensitivity. For black carbon, I think there are some ways we could improve its detection limit. But we've only started using it for this purpose - three months at the most, so we're still exploring its limits. We need to do this before we decide what we want to do with it and how much we want to improve it. What this instrument that Florent has created can do is measure the surface area of snow by optical methods. We've shown in our models that a minute concentration of black carbon - from ten to a few hundred parts per billion - will darken the snow, perhaps imperceptibly to the naked eye, but enough so that when exposed to stronger solar radiation in the spring, it starts to melt earlier. And when the snow retreats and you expose soil and ocean this allows the sun to warm our planet much faster than with snow cover present, this is an internal dynamic of the climate system called "ice-albedo feedback" that is triggered by minute traces of black carbon. And that's why the Arctic changes so dramatically due to such a small amount of aerosol. It's not something that you visually pick up on with the naked eye. Florent's instrument is a way of quantifying how much sunlight snow reflects, regardless of whether there's any soot in the snow or not, and the beauty is that it can go anywhere. You can measure clean snow under all sorts of conditions. You can have varying levels of snow reflectance depending on its metamorphic state. We can make predictions and look at observations and go downwind of pollution sources in the Alps or elsewhere to see if the measured snow reflectance agrees with what our models predict, and I don't think that's ever been possible before. Before the only option you had was to go out in the field with liquid nitrogen which is not easy to do - freeze the snow, bring it back to a lab in order to measure the surface area of the snow crystals and determine reflectance. Now you can go out with this portable instrument, this laser with a battery pack, shine it at the snow and 20 minutes later go to the next spot. By going to areas where there are more pollutants, we expect a stronger signal from the darkening effect that the pollution causes. And so you can test your predictions in the regions where there's a lot of dirty snow. By extension, the physics are the same for all snow, but when you have fewer impurities it's harder to measure. So the idea is to either confirm or refute the models and your expectations by going to the dirtier areas, where you can get a strong signal, and then extrapolate that to the more pristine areas, such as the Arctic and Antarctic, which are not uniform as far as concentrations of pollutants are concerned by any means. There are parts of the Arctic that get very strong doses of pollution every now and then from a biomass burning event, for example. A big forest fire event in Siberia in September will throw a lot of soot on the snow and ice that stays there all winter. It's not a uniform environment, but it's generally more pristine than the mid-latitudes and the Alps, where you can see the black carbon pollution with the naked eye. In your opinion, in order to better understand black carbon's effects and mitigation strategies, what kind of research still needs to be done, whether taking in-situ measurements or improving the models out there looking at warming? There are two things that I would say are very important to do for models and for research in general. 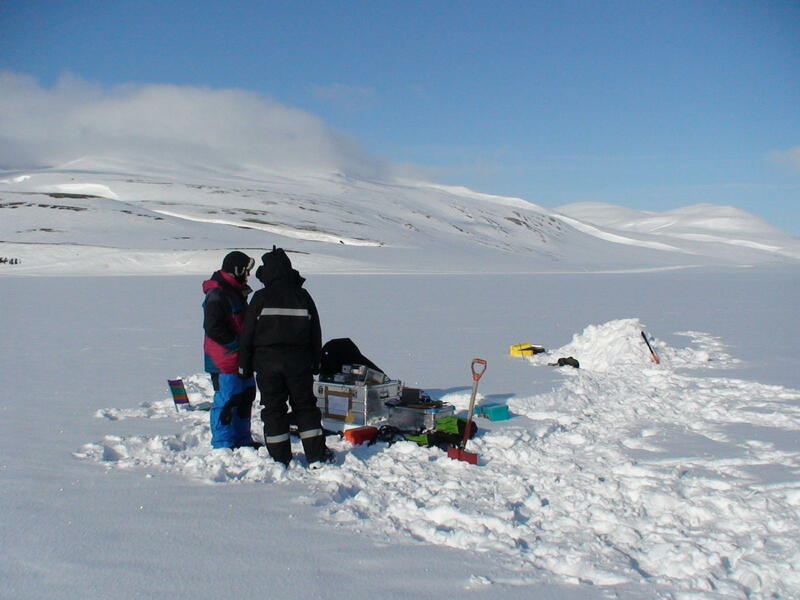 The first is to incorporate better the effects of impurities in the cryosphere into climate models. We've started to do this, but it needs to be done not only for snow but also for glaciers and sea ice. Since the cryosphere is changing so rapidly, one of the things we're asking ourselves is how and why it's changing so rapidly, and these impurities in the cryosphere are another positive feedback mechanism that isn't represented in many current models. We know we're neglecting an important process in terms of sea ice because we're not accounting for all of its disappearance. The second thing is to look at changing snow and ice reflectivity and incorporate that into our models. The state of the snow and the ice in Polar Regions is changing in thermodynamic ways as the planet warms, which to some extent is predictable. And it's also something we can go out and test regionally. We can look at regions that are warming more than normal and ask ourselves, "Is snow reflectance changing how we expect it to change in our models?" We need to verify the processes we're measuring in the lab under controlled conditions and see if it's really showing up as long-term changes in the seasonal or monthly average reflectance of snow in different regions. The same would go for both snow on sea ice and snow on land. Satellites and carefully coordinated field observations with those satellite observations can help answer those questions. You have instruments on the ground like the one Florent has built which can give you the specific surface area of the snow, and can get the reflectance from satellites and from models. However there's no way to get the specific surface area of snow at a point without having someone standing there and measuring it. It's more reliable than using satellites to take reflectance measurements, since you can sometimes have interference from clouds or other "noise". So it takes some coordination to get the whole picture. It's an important process that I think has been overlooked. What exactly do you mean by the specific surface area of the snow? It's essentially the surface to volume ratio of the snow crystals. Snow is not solid frozen water like ice is. It doesn't have a flat, smooth surface. Since it's made up of tiny, loosely-packed crystals, you have all these nooks and crannies in the snow pack. It's like trying to measure the length of the coastline of England, if you get what I mean. 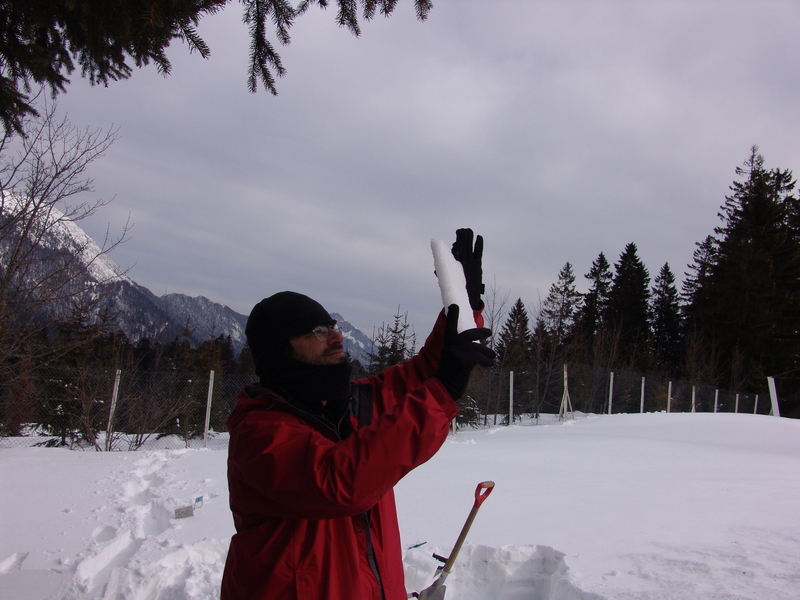 LGGE measures snow surface area better than any other laboratory out there, and they employ various methods. Like I said before, it's something that most models don't account for in their predictions of future climate scenarios, but snow reflectance changes in predictable ways with temperature and climate. So we need to incorporate this process, this changing reflectance, this changing specific surface area of snow into our future climate forecasts. I should mention that black carbon changes the chemical composition of snow, and it's well recognised that this has an impact. What's less recognised is the effect that physical properties of snow have on the climate. Snow's physical properties change over time through a set of processes called snow metamorphism. This includes change in the snow's specific surface area, which in turn determines the density of the reflectors that scatter light and thus its albedo. There are also some other properties that you need to take into account such as snow permeability, which determines how much air circulates within the snow. This affects how heat can be transferred to the ground, or how the ground can lose its heat to the snow. You also have heat-conducting properties of snow that can affect things like permafrost extent. So right now people's attention has been drawn to the chemical properties of snow, but I think people are also going to become interested in the physical properties of snow as well. Charlie Zender is Professor of Earth System Science and of Computer Science, as well as Vice-Chair of Graduate Studies at the Department of Earth System Science at the University of California, Irvine. His research focuses on aerosol-climate interactions. Florent Dominé is Senior Scientist at the CNRS at the Takuvik joint International Laboratory at the Université Laval, Québec. He investigates snow-permafrost-vegetation-climate interactions.